If you have the time and are reasonably fit we highly recommend our Full Day Climbing Adventure. Signing up for our full day means that we can choose from longer and/or more climbing routes. Full climbing days are only offered when the weather permits us to be out for a full day. This usually means Spring and Fall only, as the summer and winter conditions are to harsh for full climbing days. In addition to getting you up some killer routes we’ll help you focus on movement and mental strategy for climbing harder routes. Know that when you book a trip with us you are booking a private adventure. This means that there will be no one else along to adversely effect your experience and also allows for your guide to tailor the excursion to your needs. Technical gear required for the trip will be provided. Footwear (running shoes are sufficient). We supply footwear if there is a chance of getting wet. Hiking Clothing (nylon shorts, pants & shirts) they dry fast and do not wick warmth away from the body like cotton. Please park your vehicle behind our shop. Bring all of the above personal items into the shop with you. Do not worry about packing them in your own pack. Your guide will explain outfitting and how to pack your gear. 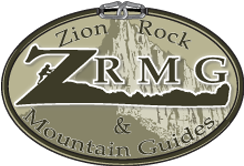 ZRMG: 1458 Zion Park Blvd Springdale, UT 84767 (we are between the Best Western and the Chevron Station) on the west side of the road. We reserve the right to occasionally have clients drive themselves to and from the location. Do we need any experience? No, depending on the climbs chosen there may be some uneven and steep terrain, but the skills associated can be taught and learned during or time together. All climbing skills necessary for a great day will be taught as we go. Fitness helps! – but the trails and terrain we choose dictates how hard our trip might be. We can tailor any trip to fit your groups needs. Can kids do this trip? Absolutely! Kids are natural hikers and climbers. They climb curtains and couches and when rock is present they climb that too. There is no better time for an introduction to the vertical world than when you are a kid. The youngest we have taken is 4 years of age. How young or old can you be to participate? We really don’t have age limits as everyone is different. It’s kind of a case by case basis. Four years of age seems to be about the age when kids start to appreciate it. Seniors are welcome as well. Let us know if you have specific concerns. Can people who are scared of heights enjoy Canyoneering? Absolutely! If you are willing to give it a shot. For some, it is a great way to overcome or at least face your fear. We like to say that there is good fear and bad fear. Good fear keeps you alive, whereas bad fear keeps you from doing things that you are capable of. Since your trip is private we can also tailor trips specifically for you. What if one of us does not want to continue or wants to sit a particular hike out? Once we are out we are a pack and we will stick together. Think hard about this before you book a trip and discuss with us any concerns you might have. We can almost always tailor a day to suit any need. As much as possible we try to provide transportation. We reserve the right to at times ask clients to drive their vehicle to the activities location.